House finches are migratory songbirds that inhabit most of the United States. House finches are considered to be a wild bird. 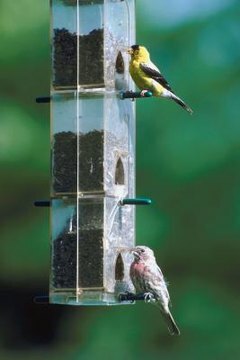 While it is common to see house finches living in outdoor birdhouses and eating from bird feeders that have been set out by wildlife enthusiasts, house finches are not commonly kept as domestic pets. If you encounter a sick house finch, you have limited options to help him. Because you do not see the same wild house finches every day, it may be difficult for you to determine what is normal for an individual bird and what should be interpreted as a sign of illness. A sick bird may be lethargic and seem unwilling to move. He may not want to eat or drink; he may have a visible wound, swelling, unusual growth or other physical injury. Conjunctivitis is essentially a respiratory infection that has taken a large toll on the house finch population during the past several years. House finches who develop conjunctivitis will appear to have swollen, red, runny and crusty eyes. In severe cases, the bird's eyes might even swell or be crusted over, leaving him unable to see. Birds in this condition have a difficult time flying or feeding and may stay low the ground or appear reluctant to travel. Wild birds only should receive medical treatment from individuals who are experiencing with specifically treating wild animals. If you see an injured or sick house finch, contact your local animal control or animal rescue organization and have them put you in touch with an individual who is licensed and experienced with rehabilitating wild animals. Only an experienced wild life rehabilitator has the skills needed to help bring sick house finches back to health. You can help prevent other house finches from becoming ill. If you notice a sick bird using your bird feeders, houses or baths, you need to take down those items and clean them. Cornell University recommends cleaning these items with a solution that is 10 percent bleach as well as removing all old bird droppings from the items. Regular cleaning and disinfecting will help prevent diseases from spreading between sick house finches and healthy house finches.